Foreign USTreasury Bond dumping continues, and even accelerates. China and the Saudis are selling USTreasurys in a near panic. Foreign central banks liquidated a record $375 billion in USGovt debt in the last 12 months. An American disaster lies in the making from debt saturation, debt overload, and debt dumping. It is all denied by the Washington mouthpieces and the Wall Street handlers, as they lie. The USGovt debt default is within view, dead ahead. 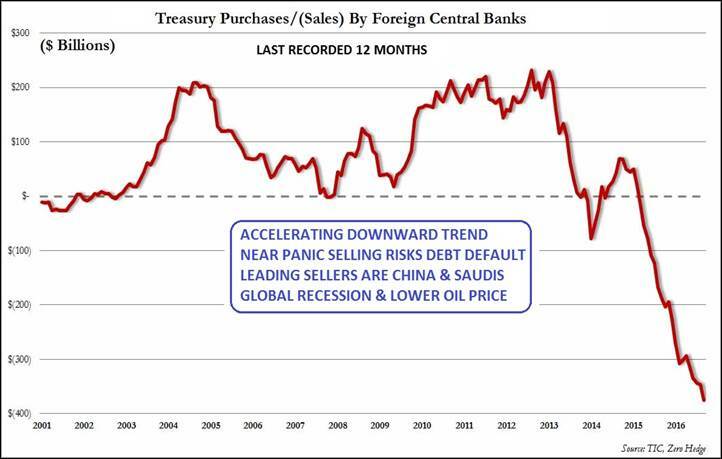 One month ago in October tally, the USFed update of Treasurys held in custody revealed a frightening picture of foreign sales, big sales, even accelerated sales. The total amount of custodial paper had fallen to $2.805 trillion, the lowest since 2012. One month later, foreign central banks continued their relentless liquidation of US debt paper, as measured by the same custody account. Foreign central banks, sovereign wealth funds, reserve managers, and virtually every other official institution in possession of US debt paper, are liquidating their holdings at a frantic pace. They respond to domestic pressures with deficits to finance. They respond to the US fundamental situation, which resembles a Third World nation on a debt basis more so with each passing month. The next fiscal year for the USGovt is actually incredibly astonishingly on pace to surpass the $2.0 trillion mark in the deficit. Obama goes out with a bang, with accolades and applause from his fawning fascist fold. His dimwitted dowdy devoted followers even cheer the rising ObamaCare premiums, which they fail to comprehend as rising costs. See the monthly Treasury Intl Capital (TIC) data for the month of September, the latest reported month. In October the latest 12 months (called LTM) had a massive $343.0 billion in USTreasury sales by foreign central banks. It recorded the period from July 2015 to August 2016. One month later, using the update for the September month, the LTM in USTreasury sales has increased to a shocking level. A robust frightening record setting $374.7 billion in offshore central bank sales was observed. It recorded the period from August 2015 to September 2016. Over one third of a $trillion in USTreasurys sold in the past 12 months, a continuing trend. Yet it is not in the financial news, not given importance, not given emphasis. This is hemorrhage. This is abandonment. This is near panic dumping. This is a glaring red signal! Among the biggest sellers of USGovt debt were China and the Saudis. The great lie is that the bond buyers are from private demand, both foreign and domestic. The great lie is that the USFed is drawing down its balance sheet with selling to the private institutions. The great lie is that the recovery continues apace. All lies!! Bold lies!! The stark reality instead is that the many central banks are soaking up hundreds of $billions in official debt. The truth is that the US Federal Reserve, the Euro Central Bank, the Bank of England, and the Bank of Japan are all increasing their USTBond holdings, soaking up the massive volumes of USTBonds dumped on the international market. The truth is that the USDept Treasury is ramping up the derivatives, engineering Interest Rate Swap machinery to create phony demand that soaks up the massive volumes of USTBonds dumped on the international market. The central banks are stressed, while the machinery is strained. The new Trump Admin will have a major challenge to finance the $1 trillion infra-structure projects. The USFed might have difficulty in monetizing the costs. In a highly dangerous situation, the 10-year USTreasury Bond yield (TNX) is over 2.3% on a short-term steady basis. Control is being lost with interest rate swap derivatives, while the USFed balance sheet is taking on losses. A frightening yield target of 3.1% is presented for the TNX, with dire implications of bond market collapse. The USFed balance sheet is totally wrecked, with impact on shared profits back to the USDept Treasury and vacant funds for federal mortgage subsidies. Debt default is dead ahead, never mentioned, never considered. Notice the scary prospect from the technical analysis, as a clear Cup & Handle reversal pattern for the TNX is presented. The top is at 2.3%, the current reading, but with a bob and weave above the breakout resistance level. The bottom impulse was roughly at the 1.5% level. The toxic target upon full reversal would take the TNX to 3.1%, with full wreckage of everything in sight. The elite supposedly sophisticated derivative machinery stands at risk of destruction. Momentum traders (aka the Mo-Mo crowd) notice the moving average crossover marked in the green circle. 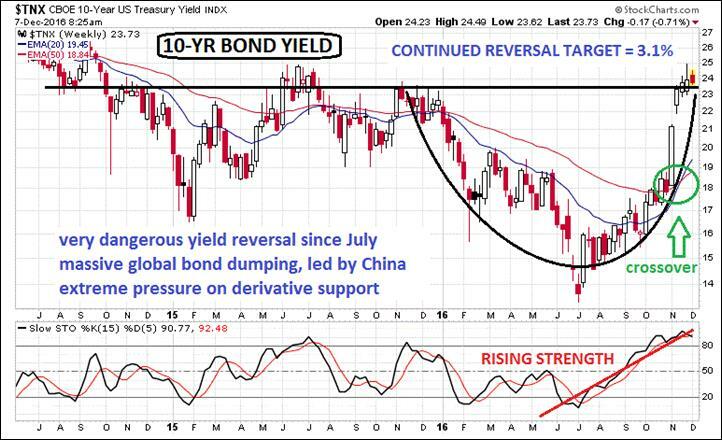 This marks a highly bullish signal for higher bond yields to come. It signals more gusto in the upward bond yield move, as though it has not already been with plenty of gusto. After some consolidation, lies on normalcy, and deception about return to stability, expect the TNX to resume its rise and gather global attention as the unprecedented abandonment continues. Look out for the TNX to reach past 3.0% in the few couple months, which would be extremely disruptive and likely force an open crack in the USTreasury Bond complex. To the Jackass, it is inconceivable that continued bond yields upward could occur without open discussion and actual planning of USGovt debt default. The restructured debt, or better yet writedowns on the debt, would be coincident with the New Scheiss Dollar devaluation. In other words, the USTBonds would follow the new dollar down in value. In such a climate, dozens of big Western banks, and possible several Asian banks like in Japan, would go bust, and enter failure. Think bank failure contagion. The big US banks are buying USTBonds with abandon, the national icon institutions acting like a big animal eating its own legs, expecting to enter a sprint toward survival. The damage to USFed balance sheet holdings will be astounding. They hold over $4 trillion in USTBonds, and most were purchased at lower bond yields, thus higher price. They face huge losses, amplified with derivative leverage. All finances for the USGovt are in ruins. The USFed has been talking about moves toward normalcy. Not even remotely possible! The Jackass adds that for the USFed to revert to normal rates, which would reflect the true fundamentals, the bond yield should be at least 8% to 10%, like Greece before the fire trucks arrived with Euro Central Bank markings. Maybe yields would rise to between 12% and 15% if not subject to intervention, as in with a free market. The annual federal deficit was $1.4 trillion in the completed fiscal year. Almost no true buyers exist outside Japan. The annual trade deficit is over $500 billion, another hemorrhage. This is game over, with debt default dead ahead. The introduction of the New Scheiss (domestic only) Dollar should shut the game down. Its devaluation due to the massive trade deficit would cause chaos, disruption, panic. EuroRaj added some comments in a fresh unique perspective. So far in the after-glow of the Trump victory, no sign yet has been seen for the Japanese doing any large scale dumping of USGovt debt. In order to keep the Japanese interested in continued USTBond holdings, the cabal has to do two things. They must maintain a rate differential at the 10-year bond for the two countries at 2% or more. They must keep compensating the drop in USTreasury Bond prices with an increase in USD exchange rate versus the Japanese Yen. The Japanese are very important since they hold around $1 trillion in USTBonds. The Tokyo creditor bunch hold more USTreasurys than the Beijing creditor bunch. Huge strains have been put on the USDept Treasury for its Exchange Stabilization Fund for to carry out the bond yield movement while engineering a USDollar continued rise. In fact, more accurately described, the USFed and their destructive economic fallout have wrecked most other foreign currencies. The USDollar is not strong, but rather the other FOREX currencies are dying. Several problems arise because of such twin requirements. 1) The weaker JPY creates competitive advantage for Japan versus the EuroZone. Hence the EUR currency has to keep pace or else their growth suffers. 2) China will continue with its RMB devaluation which hits US companies. It cannot be labelled a currency manipulator when Japan and Europe do the same in self-defense standard policies. 3) Ford and GM will die and so will a lot of the industrial firms like Caterpillar. 4) A nasty backdrop is presented where consumer demand is in decline, despite all the financing tricks by the automakers and their networks of dealers. The leverage requirement has put the Wall Street banks at enormous risk. Big moves in the USTBond yield might put the entire USTreasury complex at risk of fractures, following the December monetary policy change a year ago. The human element in derivative room response could be at a breaking point. Any actual usfed rate hike could send the USTreasurys into a veritable breakdown. Beware of sabotage, with an official rate hike and forced launch of the new Scheiss Dollar (domestic only). Since the fake Fed Rate hike last December 2015, the big US banks have been more leveraged than ever. The are left vulnerable to precisely what we see now. The sudden rise in the 10-year USTBond yield from 1.5% handle in July to a 2.3% handle this week has placed tremendous risk on the entire Interest Rate Swap machinery, which maintains control in the bond market. The next couple months could possibly break the USTreasury Bond market. An enormous amount of USTBonds have been dumped on the market. Such is the direct response by Asian nations in disgust for continuation of the bond and currency fraud, and refusal to enact the Global Currency RESET as agreed upon. The heavy bond volume in sales has put extreme pressure on the IRSwap derivative machinery. It cannot tolerate the unstable outsized movements. The derivative control rooms are staffed by people, and they are dealing with uncharted territory, great volume, and an absence of legitimate buyers. The USTBills and Fed Funds futures contracts are indicating a rate hike at the next FOMC meeting, over a 95% chance. The USFed is rumored to be preparing the rate hike with language to indicate it is consistent with their plan, in reflection to the bond market reality, in the face of economic growth, in a return to normalcy. What total rubbish and utter deception! The economic recession is in its eighth consecutive year, and growing worse. An official USFed rate hike might cause the bond market to fracture with gaping open cracks evident for even the most compromised bank analysts to perceive. Worse, if a sabotage plan is being readied to sidetrack the Trump Admin, a rate hike would be a perfect one-two punch. The second punch would be a directive by the uber-bankers still in charge to abandon the global reserve status of the USDollar, which would force the USGovt to launch its own domestic-only USDollar. The Jackass has called this item the New Scheiss Dollar, since it would be devalued quickly and repeatedly. A new USDollar currency would render the USTreasury Bond as orphan, owned by foreigners. My firm belief is that a debt default restructure event would occur, with the US Federal Reserve at the epicenter of the bankruptcy event. Foreign bond holders of USGovt debt would receive 70 cents on the dollar, roughly what the first devaluation would be. The only alternative is for the USGovt to lease 10,000 tons of gold bullion to create a new gold-backed dollar. So far the Washington NeoCon fascists have refused the Chinese gold lease offer, since control would be lost. The likelihood of the US Elite producing their stolen gold to aid the US nation is near zero. They spent much of the gold on space fleets, underground cities, and simple investments like buying nations. The derivative obelisk is like the Sears Tower, but made smaller at the base and much taller. It cannot handle the bond movements like strong gusting winds. A big derivative accident lies ahead, within view. Imagine the Sears Tower at 110 stories high with a fixed base. The USFed action last December rendered the base with smaller footprint (less area) and pushed the height another 40 stories higher. So now the New Sears Tower is over 150 stories high and with a 30% smaller footprint, thus tremendously less stable and more vulnerable. In the last several months the impact of the nasty Canadian Arctic winds from the lower oil price, then the nasty Chinese trade winds with significant bond dumping, have combined to put perhaps fatally dangerous pressures on the Sears Tower. The derivative supports do not care whether the winds are from the west or from the north. Any severe winds can wreck the structural supports for the bond tower. There are limits to the strength of pylons and buttresses, even to steel frames.